Best Burn Firewood - About Us - Locally Founded in Wisconsin! Best Burn Firewood, a firewood company based in Waukesha, Wisconsin, was founded in the end of 2016 by Tyler and Brady. We are two brothers who have a deep passion for the environment, a love for the outdoors, and are very involved in the local community. 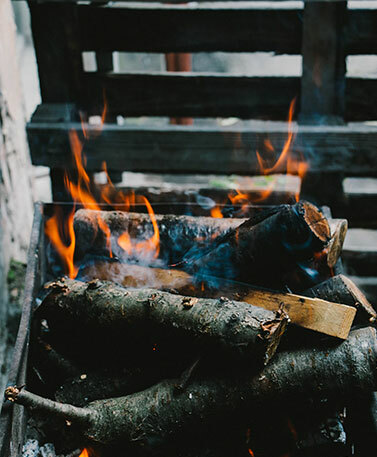 While growing up in Waukesha, Wisconsin, the main source of heat for our home was from wood, which my brother and I would gather for our parents. Even today, we both use wood furnaces to heat our homes. We work hard, so you can enjoy a warm winter or any special time of the year that calls for some wood! We get our wood both from Wisconsin logging companies who do huge land clearing projects, and from other local wood sources, so you are assured of getting 100% Wisconsin Firewood. These companies only bring us wood that meets our strict requirements. They deliver the lumber directly to our location, where we process it into firewood. We carry many types of wood including mixed hardwoods, oak, cherry, hickory, and black locust. Each wood has its own unique features and is best for a particular use, depending on your requirements. We are always happy to assist our customers in determining what will work best for their needs. Wisconsin Firewood for Sale:Same-Day Delivery! After our experience personally purchasing firewood over the past decade, one thing that we found which was off-putting was all the junk that came with each delivery. We had so much dirt, debris, and junk wood left over in our driveway that we wondered how much wood we were actually getting! Our solution is simple: Instead of scooping from the pile of wood, which collects all the junk, we take the extra step and hand pick every single delivery and load it into the truck by hand. This means you don't get all the dirt and debris left over in your driveway, and are getting the exact amount of wood that you ordered! Call us at any time of the year, whether it's in the hot summer or freezing winter. We also have100% kiln dried Wisconsin Firewood for Sale. We offer stacking of your firewood delivery upon request! and never look for another reliable Wisconsin firewood supplier again!